South east London isn’t a favoured destination on the fossil hunter’s trail – visitors aren’t known to walk the streets of in search of ammonites and the petrified remnants of a much earlier era. 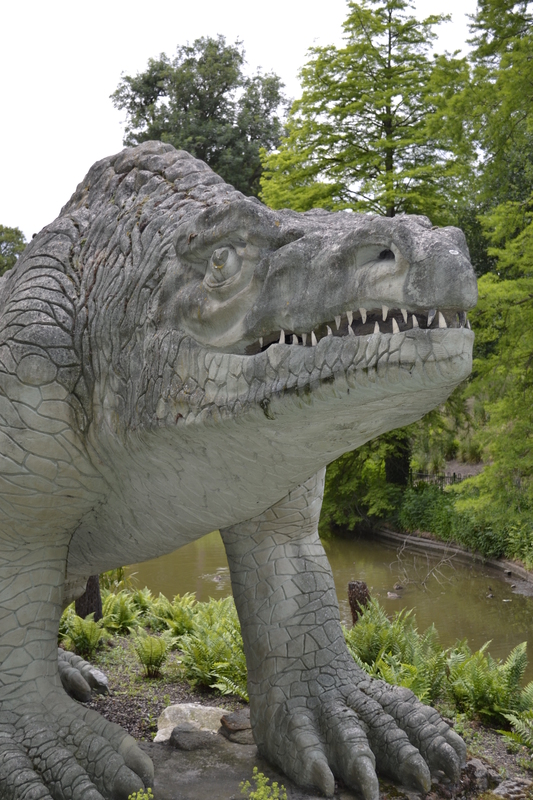 However, an eccentric and – to the modern eye, enchanting – Victorian vision of prehistoric life can be found in Crystal Palace Park. 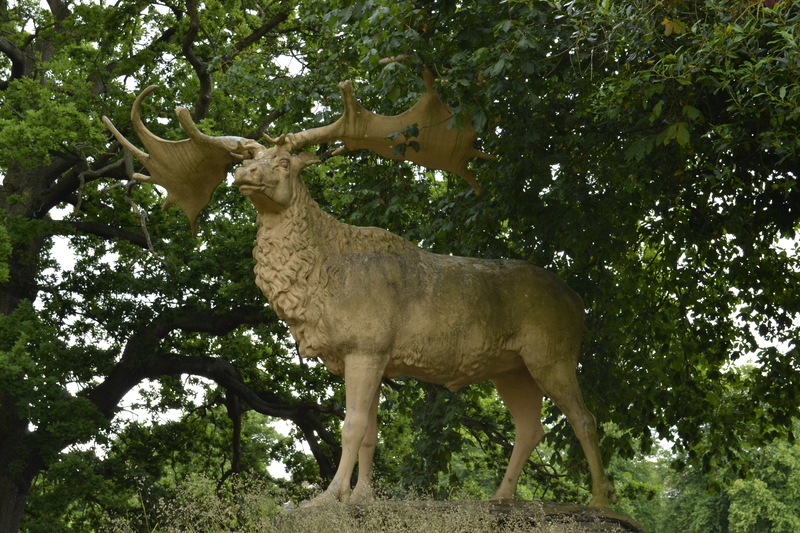 These concrete beasts are the result of a collaboration between Professor Richard Owen and Benjamin Waterhouse-Hawkins and were commissioned by The Crystal Palace Company in 1852. Wildly inaccurate, the dinosaurs are still important pieces of architecture. They are examples of early concrete use and ingenious Victorian design. In 1973 they were given Grade II-listed status and in 2002 they were deemed a vital part of our built heritage and were reclassified as Grade I-listed. 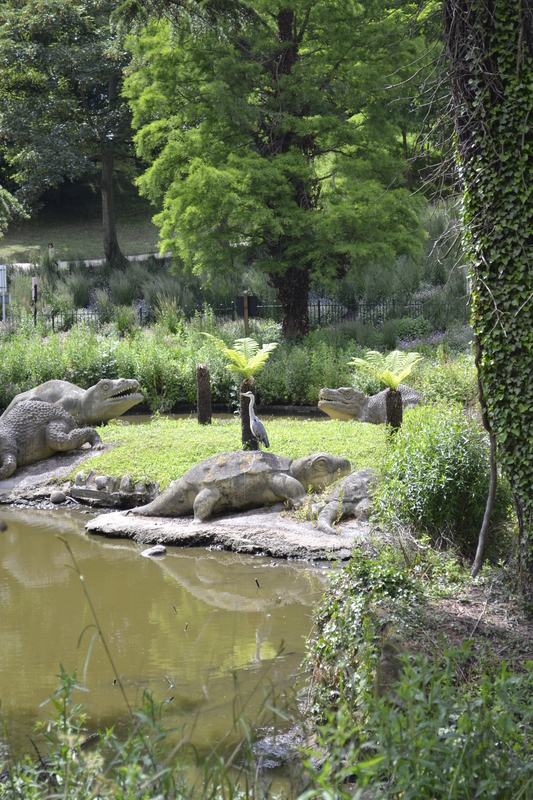 Professor Owen, originator of the term ‘dinosaur’ and eminent Victorian naturalist was tasked with producing the thirty three life sized dinosaurs in Crystal Palace Park. With the help of the famous sculptor and natural history artist, Benjamin Waterhouse-Hawkins, Owen used comparative anatomy to flesh out the design of the sculptures. Owen and Hawkins wanted their sculptures to be educational as well as awe inspiring so every detail, from the size to the natural habitat of the creatures, was discussed with the best palaeontologists and archaeologists of the day. Although not immediately obvious, the dinosaurs are in fact arranged in chronological order. Paxton and Hawkins wanted to take visitors on a journey through time, a controversial decision when Creationism rather than evolution was widely accepted. Charles Darwin’s On the Origin of Species was not published until November 1859; five years after the Crystal Palace Park was opened to the public. Often Hawkins had only small fragments of bone to work from and the process was in large part creative guesswork. 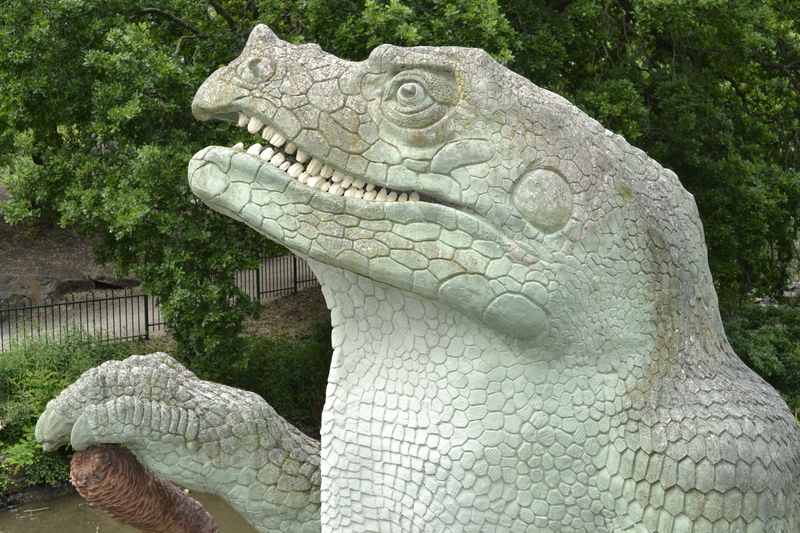 There are some charming anatomical quirks to the dinosaurs as they stand today. For example, the enormous iguanodons that languish beside the tidal lake have an impressive horn on their heads yet we now know this would have been one of their thumb spikes. As only one such fossil was found, Hawkins came to the entirely logical conclusion when comparing the iguanodon’s bone structure to that of a rhino that the horn would be in a similar place. In fact, no one could agree on whether the iguanodon more closely resembled a rhino or a lizard so Hawkins represented both imagined incarnations. One Iguanodon stands proudly on all four legs whilst the other has more lizard-like hind legs, its torso dragging on the floor. But without the Crystal Palace itself the dinosaurs would never have been commissioned. The creatures were designed to fill up space and add interest to the enormous 200 acre plot the Crystal Palace Company had purchased in the Sydenham countryside. At nearly 500 metres long it was an impressive addition to the landscape. The new Crystal Palace was intended to provide everything that central London galleries did but in a relaxed, rural setting. The Crystal Palace Company just didn’t have the clout that the well established London museums did so they had Byzantium Galleries and Medieval Galleries filled with very expensive reproductions. Sir Joseph Paxton, the landscape designer and architect for Crystal Palace, wanted to build an opulent pleasure park, with more fountains than the Palace of Versailles. Over 22,000 fountainheads were installed in the Park grounds producing an incredibly opulent display. The enormous volume of water had to be stored somewhere so the engineer Isambard Kingdom Brunel was brought in to design the water storage towers. The water from the fountains collected at the bottom of the plot of land, forming a boggy area that held little interest to the Crystal Palace patrons. The dinosaurs were introduced to this far corner of the park not only as a way to fill the space but to entice visitors back to the Palace. After they had seen the reproduction exhibitions inside and enjoyed the shooting ranges in the grounds, Hawkins hoped that visitors would be so enthralled by the beasts he had created that they would return again and again. The Crystal Palace itself, built to a Beaux-Arts design, suffered severe damage from a series of fires and was finally destroyed in November 1936. You can still visit the dinosaurs though! An extract from the autumn 2013 SPAB Magazine. The Magazine is a benefit of SPAB membership.